We are a team of artists and designers based in Atlanta, GA. Most of us are members of a fraternity or sorority, so we understand your story and know exactly what you need for your Greek paraphernalia to be top-notch. Those of us who aren't members of Greek-letter organizations have strong ties to Greek life through family and friends. We pride ourselves in offering a superior product and a remarkable experience. 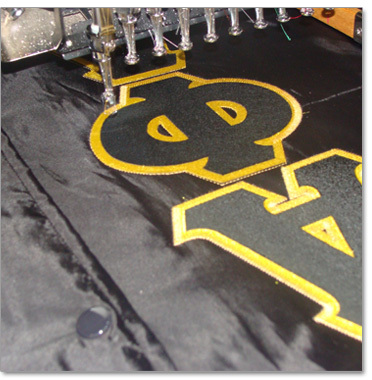 We've been making Greek apparel for over a decade, and our experience shines through every stitch. Any company can sew three letters on a shirt. But only stuff4GREEKS can turn you into a walking piece of art. 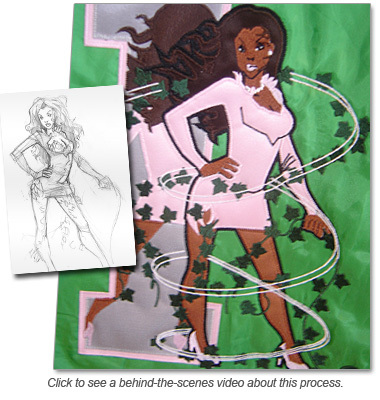 Come to us with a vision, idea, a sketch, or a photo, and we'll make it an embroidered masterpiece. We are fine artists. Our medium just happens to be Greek apparel. We've made a commitment to always show people a proof before we start stitching their order so that it will look exactly how they envisioned. You can rest assured that your order is being hand-crafted specifically for you, by people just like you. Our products are not mass-produced in a sweatshop overseas. College-educated people with extensive training, earning salaries with benefits, are making your stuff right here in the USA. When stuff4GREEKS started back in 1999, we only designed flyers to promote fraternity and sorority parties and events. We launced the first version of our website in 2002. After a while, people started asking us to design their t-shirts. We said okay. Then their line jackets. We said okay. 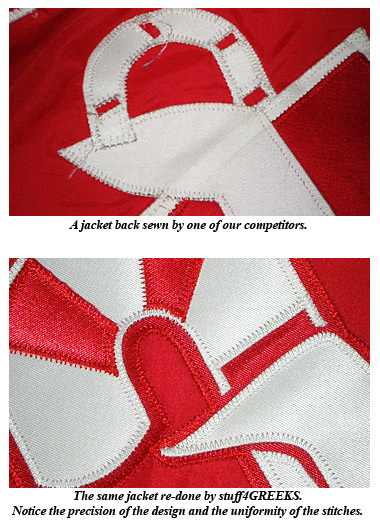 Now, after over a decade and thousands of jackets later, we have perfected our craft and are considered experts in the industry. Our work has won awards and received tons of recognition. Read our full story here. If we were a restaurant, we would not be a fast-food chain or an all-you-can-eat buffet. We are more like a fine dining establishment where you sit down on a beautiful evening and enjoy an exquisite meal. Our goal is to give you an outstanding experience, a superior product, and leave you with a great memory that you will talk about for years to come. Click to read the full comparison...and find a 20% off promo code!